Polybloggimous: We'd Like A Word With You, Please, Mr. Nugent. Last week, a week that was already pretty eventful for the U.S. Secret Service, got even eventfuller when Ted Nugent exercised his First Amendment Right to scream, THERE'S A FIRE IN THAT THEATER AND I LIT IT AND IF I DIDN'T LIGHT IT, I'M GONNA LIGHT IT AND MAYBE I'M JUST BEIN' METAPHORICAL (WINK, WINK, NUDGE, NUDGE), BUT IF I'M NOT, IT'S YER OWN DAMN FAULT. DON'T SAY I DIDN'T WARN YA! Ted can get a bit breathless sometimes. As a result, the Secret Service was forced to take time off from vetting South American Entertainers to interview Mr. Nugent. It's since been reported that they have deemed Mr. Nugent to be no threat to the President, but I found myself intensely curious about what the contents of that conversation might have been. Fortuitously, my cabal of International spooks, spies, moles, undercover operatives, intelligence agents, sleepers, infiltrators, espionage experts, sleuths and snoops were able to get me a synopsis of Mr. Nugents audience with The Man. The conversation began with Agents Brobdingnagian and Behemoth getting right to the point and asking Ted for a clarification of his statement, “If Barack Obama becomes the president in November again, I will either be dead or in jail by this time next year”. 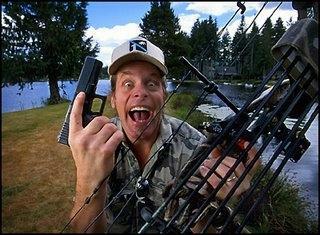 Mr. Nugent explained that although he had begun by speculating about any results from an Obama reelection, he had immediately lost his train of thought and moved on to considering the possible ramifications of crossing a busy street or hunting pandas out of season; possibilities that might leave him deceased or incarcerated. "It was more in the way of a non sequitur", he concluded. Agents Brobdingnagian and Behemoth allowed as how that made a certain kind of sense and moved on to other topics of interest. Behemoth asked about another Nugent statement to the effect of, "...I don't know how they do it but they sure do it good. I hope they're doin' it for free" and followed up by querying about Mr. Nugent's success with locating those who were "doing it for free". Nugent acknowledged that he had, in fact, had great success in those endeavors during his more youthful days, but attributed much of it to loud music, and substance abuse among his fans. Brain trauma was another factor that was posited. Behemoth moved on to a discussion of what Mr. Nugent might consider desirable when selecting travel companionship which Mr. Nugent summed up by saying, "All you pretty woman, you're so far and in between. I don't need no fancy tarts; I need the ones that's clean". When questioned about the specific steps of the Wango Tango, Nugent demurred, explaining that he was no longer as agile as he once had been. Agents Brobdingnagian and Behemoth thanked Mr. Nugent for his time and requested that he avoid discussing the President, difficulties with negotiating traffic and outdoor sports in the same sentences to avoid any future misunderstandings. Mr. Nugent thanked them for their devoted non-partisan service and expressed his sincere hope that the Agency would find his pointers beneficial. Ya know, without the hair ol' Ted looks just like Jim Varney playing Earnest. Sounds like him, too, without the good-naturedness. What a talentless tool, with more bullets than brains.